Our Custom Made Designer Style Medical ID Sports Band Bracelet Style 3 are The Original Designs by Medical ID Store and are light weight and adjustable. These Medical sports bands do not fit any other slide on medical alert plate except the one shown with it. Engraving is always free! 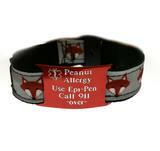 Our medical id sports band bracelets for boys are availble in fun styles with safety in mind. These are a great inexpensive way to get your guy safe and easy enough to purchase a new tag when and if medical information changes. Great Boys Medical id bracelet. Click on the Product Picture for detailed description and to purchase!